Henry Bell is Literary, Education and Community Director at the Orange Tree Theatre where his production of Three Farces, a trio of One Act Farces by John Maddison Morton, is currently playing. So why would I, a young(ish) theatre director, decide to spend most of my time not only directing the least fashionable genre in the theatre canon but also the least fashionable era from the least fashionable genre in the theatre canon? Well the short answer is because I think they are very funny. I first came across the One Act Victorian farce after my year as a trainee director at the Orange Tree at the end of 2007. I’d just directed an obscure Restoration play for East 15 and felt that I needed to find something that other people didn’t do. The Orange Tree has a reputation for unearthing plays that were popular in their time by authors who were once respected but have since been forgotten. Being creatively reared by this theatre has made me keener to investigate neglected periods of theatre history, like nineteenth century theatre before the Scandinavians and the Russians came along. Scene from Slasher and Crasher, one of Three Farces. A fairly arbitrary search through the internet led me to a biography of the great nineteenth century comic actor Charles Mathews. His ability as an actor unheralded; he was the Victorian Alec Guinness (though more Kind Hearts and Coronets than Star Wars). He played multiple roles in comedies that had no fourth wall and seemed to have an unpretentious universal appeal; a tour to Papua New Guinea had gone well despite several language and cultural barriers. 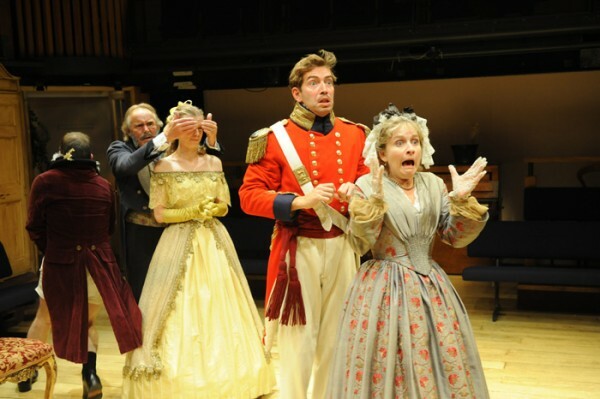 Many of the facetious, inane and down right silly plays Mathews acted in could be found on the internet thanks to the University of Worcester’s Victorian Plays Project. Tim Sheader, the recently appointed artistic director of the Open Air Theatre, let me put a small company of actors together in his rehearsal rooms and we went through a dozen one act Victorian plays, most of which were by this man called John Maddison Morton. During this workshop time it became clear that Morton’s plays had something in them which appealed to me; they were silly but were written with precision. They spoke to the audience but didn’t patronise them. They tweaked the nose of staging conventions without destroying the overall narrative. They also reminded me of many more recent comedies, from Monty Python, Bottom and the Naked Gun films and to the work of Harold Lloyd. This was the last era of theatre in this country where the characters really spoke to the audience. It was very direct and, potentially very amusing, method of writing. Morton was very aware of the fact that a play is put on in a theatre in front of an audience; not only does his work feature long direct speeches to the audience, they also throw asides into the middle of conversations. He also liked to take the piss out of himself and the art form, starting plays in curtain calls and sending up the acting profession in general. The End of 'New Writing'? Enter your email address below to get an occasional email with Exeunt updates and featured articles.